Review: TVF’s new show Yeh Meri Family has much in store for you. But not in the way you would expect. It connects with you on the most simplistic levels and yet leaves a profound impact. Set in 1998 Jaipur, this slice-of-life web series is pregnant with nostalgia. Creator Sameer Saxena (Tripling, Permanent Roommates) and writer Saurabh Khanna have come up with fresh content which brings you home, no matter which part of the world you are in, sans the excess emotionality or didacticism most nostalgia-driven narratives are prone to. The first two episodes of the series Pukam Pukai and Vish Amrit, revolve around the middle child of the Gupta household, Harshu (played by Vishesh Bansal) and his comical narrative of the disgruntled teenager who deals with problems in a middle-class household with some help from his precocious yet insightful friend Shanky (played by Prasad Reddy). Khanna’s writing captures the milieu of the ’90s perfectly throughout the episodes. The dialogues are funny yet pithy, leaving audiences reeling with a strong sense of déjà vu. One such instance is when Harshu first whines about his elder brother Dabbu over a phone conversation with Shanky. A distraught Harshu complains that his summer holidays are going to be drab and boring, all thanks to Dabbu’s upcoming exams and the unwillingness of his parents to do anything ‘fun’ as a result. Shanky imparts his patent sage-like wisdom to his friend – “Arre summer koi season nahi hota, who ek festivalhota hai. Garmi is the father of all festivals. Muh se dhua nikalne ke ilaava tu kya nahi kar sakta summersmein.” These words have its magic on Harshu and he promptly narrates a heartwarming saga of ‘summer rituals’ to the audience by breaking the fourth wall. The endearing monologue goes on to describe every other family’s joint custom of tucking into delicious mangoes, sitting together in their drawing rooms. Langra, Chaunsa, Hapus, Dasehri – all varieties are slurped with happy, messy hands and most importantly, as Harshu adds, “saari jaile khaali hoti hai,” referring to all schools being closed at least for a month for summer holidays. Harshu’s continuous nagging reminds you of your teenager self; his absolute disgust with the thought of Verma Sir, the Keo Karpin-lathered Hindi tuition teacher; his love of Bournvita as opposed to his equal and opposite hatred for milk; and his constant bickering with his oh-so-protective mother (played by Mona Singh) — all have you reminiscing in a past you wish you could get back to. Especially hilarious is the scene where Mummy sits Verma Sir down to ‘discuss’ Harshu’s state in academics, particularly Hindi. Harshu seems embroiled in a Macbethesque scenario where the three witches, his mother, teacher and elder brother conspire against him, while he helplessly watches the gradual downfall. His only saviour, his father (played by Akarsh Khurana) lets him down by not reaching home early to salvage Harshu out of tuitions. Saxena captures the narrative appropriately. Harshu’s daily squabbles get you involved with his apparent problems but Saxena does not fail to remind you through Baba Shanky that what seems the worst right now, may well be “the best days of our lives” 20 years down the lane (all hail Bryan Adams). The mothership is of course the more-than-involved being who does not let her children go out on birthdays and makes home-cooked food for her son’s in-house birthday party. Singh manages to instill a generous doze of maa ka pyaar in between her scoldings. But all the parenthood is brought to audiences in a no-melodrama, natural manner. 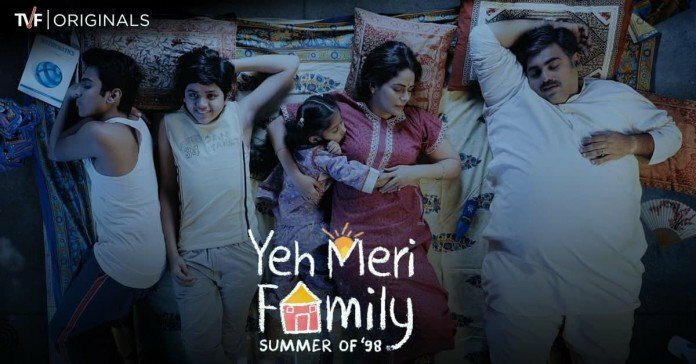 With a strong cast and seemingly strong content, Yeh Meri Family may surprise audiences with its ordinary brilliance. Yeh Meri Family streams weekly on TVFPlay and YouTube.